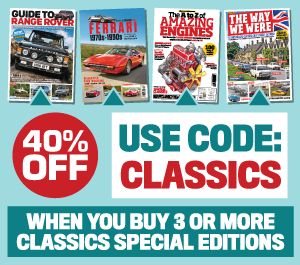 Hosted by LRO’s sister title Practical Classics magazine, this is the fastest-growing classic car exhibition in the UK, which 19,000 people attended last year. For 2016, the Land Rover Series 2 Club will appear at the show for the first time, alongside show stalwarts Birmingham Land Rover Group and the Ex-Military Land Rover Association. With a mix of models on display, the three clubs will offer expert advice on Land Rover restorations and showcase projects being worked on by club members. There will also be motoring celebrities such as Wheeler Dealers’ Mike Brewer and Edd China, and For the Love of Cars’ Ant Anstead on hand to share their experiences of Land Rover restoration, each having tackled them on TV. You can also see the latest restored cars in the Pride of Restoration display, but if you want to hear how these cars should sound, then take a passenger ride with our friends from the Sporting Bears Motor Club. They’ll be offering ‘Dream Rides’ at this year’s show – meaning you can take a ten mile ride as a passenger in one of the cars from the Dream Rides Garage in exchange for a donation to charity. The car you chose will determine the size of your donation and with a mix of marques from British Sports to Italian supercars, there will be plenty to chose from. There will also be the UK’s biggest display of barn finds with the organisers aiming to beat last year’s mix of 25 vehicles, found in various states of repair. If you are in the market for a project or new classic, Silverstone Auctions will gather the best the market has to offer while the UK’s best dealers offer classics to suit all depths of pockets. As well as more classes at this year’s show for novices, and masterclasses for those looking to enhance their skills in the workshop, more special guests on the live stage and more seminars offering expert advice, there’ll also be more traders with marque-specific retailers on offer including the UK’s biggest Spring autojumble.